Amazon's paid membership program Prime is rapidly growing its footprint — and it could be doing so at the expense of traditional warehouse club brands like Costco and Sam's Club. According to a note published by Cowen & Co. on Monday, the percentage of US households that only pay for Prime membership has more than doubled over the past four years, from 7.1% in 2013 to 16.2% in 2016. In the same time span, housholds that only use either Costco (from 14.9% to 9.8%) and Sam's Club (from 16.9% to 9.7%) dropped noticeably. 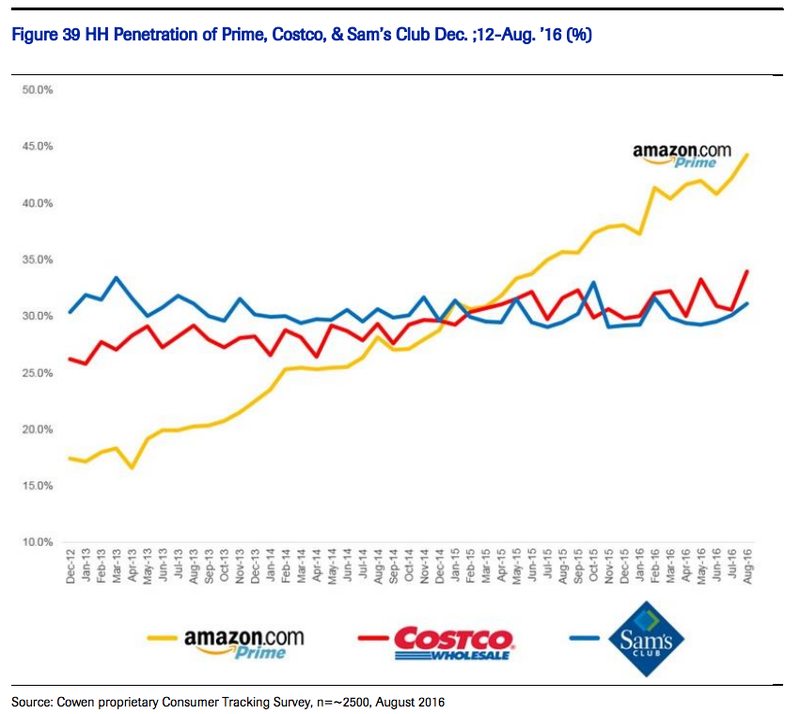 In the meantime, households that pay for both Prime and Costco memberships jumped from 4.8% to 11.3% in the past four years, while the same trend is seen among households subscribing to both Prime and Sam's Club (from 4.8% to 8.5% in 2016). Consumer Reports claims Costco's house brand, Kirkland bacon, actually tastes better than any name-brand bacon testers reviewed. It’s also much more inexpensive, costing between $10 and $16 for a 4-pound pack — about $1.50 less a pound than the leading name-brand bacon options. "In blind taste tests, we found the Kirkland Signature Real Mayonnaise to be just as good as Hellmann’s, for about 60 percent of the cost," writes Consumer Reports. The Kirkland vanilla ice cream won Consumer Reports testers over with its "big dairy flavor and complex vanilla-extract flavor." Plus, it’s just $0.30 a serving, compared to top-rated Ben & Jerry’s, which costs a dollar a serving. Cowen said the numbers indicate either Amazon Prime attracting a higher percentage of Costco and Sam's Club members, or signing up new customers who didn't have any warehouse membership before. And as Amazon continues to add more perks for its Prime members, the trend will likely continue, it said. "The risk is that as Amazon continues to improve Prime's value proposition and add more layers to the Prime service, US households could cancel subscriptions for one or both of the Warehouse clubs. 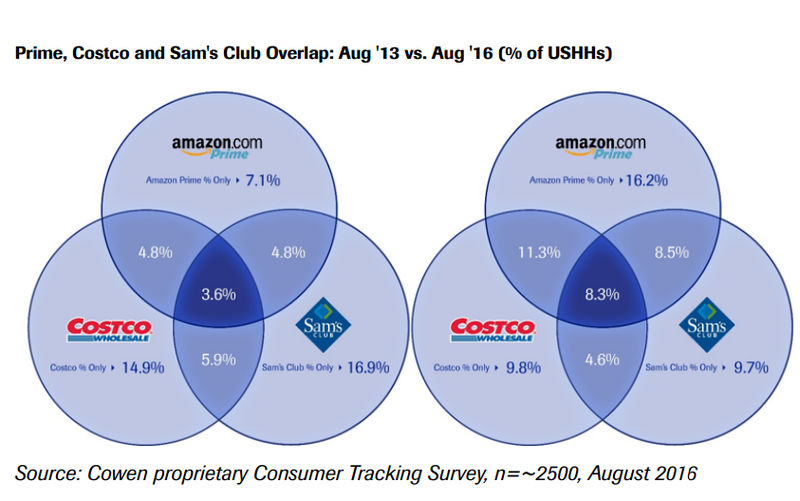 At a minimum, the number of consumers opting to just use Costco and/or Sam's Club 'Only' is likely to continue to decline," Cowen wrote in the note. Prime is Amazon's paid membership program that gives access to free shipping and its own video and music streaming services. Amazon has never publicly disclosed the number of Prime members, but analysts believe it's the roughly in the range of 50 million to 70 million in the US. Cowen pegs Prime's total membership at 49 million in the US, or 44% of all US households. That's at an all-time high, and nearly triple the penetration rate in 2012 — all the while Costco and Sam's Club's penetration rates have remained largely flat over the past four years.